Oliver Wilson, pictured after one of his earlier successes, will take a one-stroke lead into the final round of the Commercial Bank Qatar Masters after carding a three-under-par third round of 69 in testing conditions at Doha Golf Club. The 2008 Ryder Cup player was the last man in at this week’s tournament and is making the most of his chance in Qatar - reaching a ten under par total of 206 with a birdie on the 18th hole. This is the Englishman’s first 54-hole lead on the European Tour since the 2014 Alfred Dunhill Links Championship, where he went on to secure his first title. 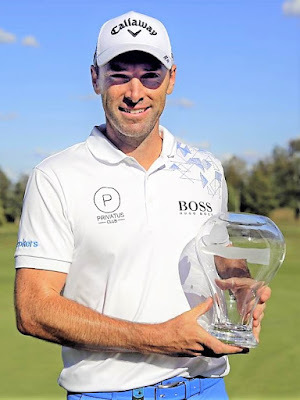 His gain on the last hole saw him pull away from a five-way tie for second place, which includes Nick Cullen, Nacho Elvira, Mike Lorenzo-Vera and Erik van Rooyen - all four of which are bidding for their maiden victory on the European Tour. Lorenzo-Vera enjoyed a stroke of good fortune as his teeshot on the drivable par four 16th hole hit a car and bounced to safety – he then converted his second of three consecutive birdies as he reached nine under par. Australia’s Jake McLeod made the second hole-in-one of the tournament during the third round, and he also eagled the 18th hole to move to eight under par alongside compatriot Min Woo Lee, Belgium’s Thomas Detry and Anton Karlsson of Sweden. Oliver Wilson: “I’m delighted, quite frankly. It’s hard out there. It’s really hard to get it close, even from the fairways with the wind. I tried really hard to keep it in play off the tees, get in the middle of the greens and just two putt. Nobody is going to get too far away and shoot super low – you just have to go out there and plod your way round. Nick Cullen: “It was pretty breezy. It swished around a little bit and gusted at times too. It was tricky to pick clubs on a lot of holes with big cross-breezes where it was hard to hold the fairways. Nacho Elvira: “I’m very happy. It was tough out there, the wind was blowing pretty hard like in the first round. I tried to keep myself in play as much as possible. I did that pretty well and I’m really happy with 69. Erik Van Rooyen: “I feel like I’d been hanging on all day until the 14th. I misjudged the wind on a couple of shots and came up short, I had a lot of long putts. That was a nice reward for staying patient and just grinding it out. Mike Lorenzo-Vera: “I was very happy after three birdies. I played alright in the day, I just had a couple of three putts on 12 and 13 – that was a bit hard for the game I was playing. When you have six/seven metres to putt, grain plus wind is very hard to get it in. I just kept to the plan and got very lucky on 16.